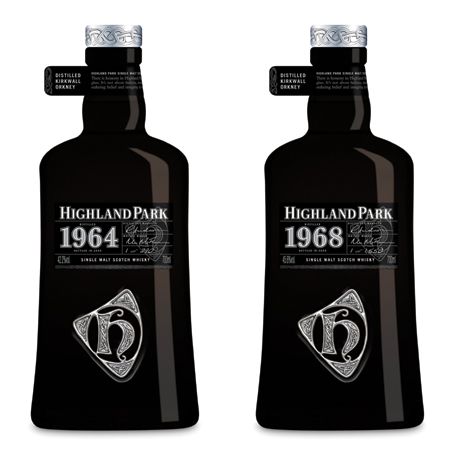 Highland Park is launching the eagerly anticipated 1964 and 1968 expressions from the distillery’s new Orcadian Vintage Series in response to the growing international demand for high quality aged single malt whisky. The success of Highland Park’s recently released 40 year old, the 30 year old before it and the distillery’s impressive climb in exports over the last four years has enabled the award winning distillery to address the growing demand for exclusive bottlings for the premium connoisseur customer. Over the next five years Highland Park will release up to ten exclusive Vintage limited editions. Max McFarlane, Highland Park’s acclaimed Whisky Maker will hand-select casks from specific years, based on their maturity and exceptional character; these will then be married together in order to ensure consistency and Highland Park’s inimitable balance. Jason Craig, Global Controller of Highland Park said: “We have worked tirelessly to take the Vintages from the initial concept to reality and we are exceptionally pleased with the end result. Followers of Highland Park respect and knowingly trust our instinctive nose and tastings and the Vintages certainly meet our high standards. The 1964 Vintage is the oldest within the Vintages Series and due to the rarity of the liquid, only 290 bottles of this finest limited edition premium single malt will be made available. The liquid has been created from only two hogshead oak casks specifically chosen by Max McFarlane and when combined will create the 290 bottles at 42.2% abv (alcohol by volume) with a retail price of £3750. The second release, the 1968, is an equally impressive malt and 1550 bottles will enter the market; both at home and abroad. Eight carefully chosen refill casks make up the exceptional character of the ’68. With its naturally golden hue colour, full bodied flavour with hints of opaque honey and lemongrass, this Highland Park Orcadian Vintage is an exceptionally fine whisky that builds on the world-class reputation of the internationally acclaimed distillery. To compliment the exquisite design of these fine liquids a distinct presentation portfolio has been expertly considered. Drawing on the current style of the Highland Park 40 year old, the Vintage’s debut is revealed in a unique decanter-esque bell-bottomed jet back glass bottle that features flashes of silver foil, embossed Pictish knot work design on necker and banding and the distinct pewter ‘H’ Amulette adorned to the front of the bottle. The bespoke black glass, the manufacturer of which is an all but defunct art form, reflects the careful artisan precision that has been considered. The silver cap with Pictish designs completes the look of this exclusive limited edition. Stoelze Flaconnage, acclaimed glass specialist has produced this majestic looking bottle that consumers can keep long after the liquid has been savoured. The 1964 and 1968 Vintages are presented in a naturally coloured oak wooden box finished to high specification cabinet quality. The craftsmen have enhanced the boxes with ornate marquetry; the pewter Amulette embedded into the front of the box which also features inlay design work. Inside collectors will discover a detailed booklet featuring explanatory notes about the Vintages range; from thought to taste. Nose: At full strength the 1964 Vintage is redolent of toasted oak, dried strawberries and shellac with a generous coating of beeswax. When reduced, toasted toffee and smouldering bonfire embers come to the fore, followed by beguiling notes of gingerbread, sandalwood and cinnamon bark. Palate: Unreduced, this expression has the delicious sweetness associated with Highland Park but combined with a fascinating spiciness, crushed black pepper, crème brulee and toasted vanilla pod add to the complexity. The addition of water reintroduces the toasted oak initially encountered on the nose accompanied by distinctive hints of Applewood smoked cheddar, vanilla sponge and paprika. Finish: Rich, long, lingering spiciness completes the sensational tasting experience of this venerable single malt. Colour: A delightfully rich, naturally golden hue with remarkable clarity and brightness. Bouquet: At full strength the 1968 Vintage is reminiscent of thick, opaque honey but with attractive notes of lemongrass, sandalwood and a variety of aromatic spices. When reduced, citrus fruits and pencil shavings become immediately apparent, followed by sweet aromas of rose and crème caramel. Finish: A lasting impression of rich spiciness is the legacy of a single malt that is extremely long and surprisingly sweet. Both Vintages will be available in the UK from specialist independent whisky retailers from November 2009. This entry was posted	on Saturday, November 7th, 2009 at 1:15 pm	and is filed under News. You can follow any responses to this entry through the RSS 2.0 feed. Responses are currently closed, but you can trackback from your own site.